These picture books can’t teach you how to dance but they can inspire you. In the curriculum on dance, students are required to create and present, reflect, respond, and analyze, as well as explore forms and cultural contexts of dance. The following stories include dance forms from First Nations, China, Japan, as well as ballet and a few dance-inspired texts. 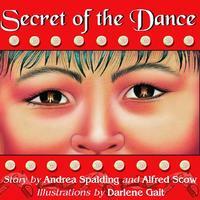 Secret of the Dance, by Andrea Spalding and Alfred Scow, illustrated by Darlene Gait, is based on a true story from Scow's childhood. Now Elder of the Kwakwa'wakw Nation and a retired judge, Scow was a nine-year-old Watl'kina in 1935 when his family travelled in secrecy to perform a potlatch, a gift-giving ceremony sacred in Indigenous culture that was banned by the Canadian government. Watl’kina and his sisters aren't permitted to attend the ceremony—if caught, the children could be taken away by authorities. But at the sound of drumming, Watl'kina sneaks out of bed and sees masked figures dancing stories by firelight. He recognizes one dancer as his father, which turns out to be the last time he ever sees his father dance. As a grownup, Scow reflects on the repealed law and how strange it is that the government now invites Indigenous people to dance for visiting dignitaries. This book is a great discussion-starter on the roles of dance in society. 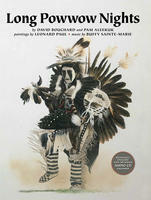 Long Powwow Nights, by David Bouchard and Pam Aleekuk, illustrated by Leonard Paul, addresses the importance of keeping culture and traditions alive through dance. Written in English and Mi’kmaq, it’s an ode—a son reminiscing about his mother who danced her whole life in the powwow, about her hardships, and how, after her death, she visited him as a butterfly. Included is a CD that includes the song, “Darling Don’t You Cry,” by Buffy Sainte-Marie. 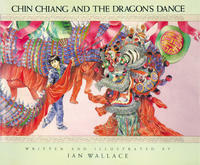 Chin Chiang and the Dragon Dance, by Ian Wallace, is another example of the role of dance in cultural expression. Chin Chiang’s grandfather explains that the great dragon in the sky will bring an abundance of fish and fruit and keep the floods away. But Chin Chiang is under such pressure to perform the dragon's dance as the Year of the Dragon arrives, to do his grandfather proud and to not anger the dragon, that he runs away. Illustrations show some of the dance steps as the boy teaches his old neighbour, Pu Yee, to take his place in the dance. In the end, however, Chin Chiang overcomes his fear. In Suki’s Kimono, by Chieri Uegaki, illustrated by Stéphane Jorisch, the dance is Japanese, handed down by Suki’s Obachan (grandmother). Suki is teased by her sisters and her schoolmates for wearing a kimono and bright red geta (wooden clogs) to school. But Suki overcomes any embarrassment when her teacher asks her to demonstrate the way she danced with her grandmother during a Japanese cherry tree celebration. The watercolour illustrations show Suki performing the steps, and when she forgets what's next, Suki makes it up, as dancers do. This story might nudge students to explore their own ancestral dances. The next two provide a glimpse into the form of ballet. 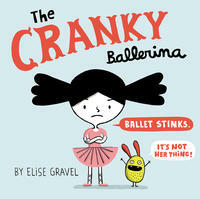 The Cranky Ballerina, by Elise Gravel, will appeal to those in gym class who dread dancing. Every Saturday Ada is cranky because she hates ballet class: the tight leotard, the itchy tutu, the car trip, the "grotesque arabesques." She just can’t seem to get fourth position, and in her frustration, pirouettes right out the door into karate class ... where she excels. A cute read with lovely illustrations for those who struggle with dance. Swan, on the other hand, by Laurel Snyder, illustrated by Canadian Julie Morstad, is for true ballet lovers. Based on the true story of a Russian turn-of-the century ballerina, Anna Pavlova knew her passion at age eight. Born to a poor family, she tried out for the Imperial Ballet School. Upon rejection for being too young, she waited (and practised, even as she hung laundry on the line for her laundress mother) for two more years. Unlike other ballerinas of the time, she was thin and frail, with arched feet that made pointe work difficult. She redesigned her shoes to make it easier, and went on to become the lead role in ballets, touring the world. Young dancers will relate to Pavlova's determination and drive. 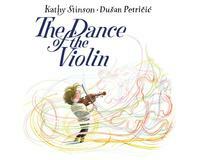 Dance is a secondary theme in the following two books by Kathy Stinson, illustrated by Dusan Petricic. Both books are a reminder of the importance of listening—a lesson in music appreciation and resilience. The Man with the Violin is the true story of well-renowned violinist, Joshua Bell, who played for 43 minutes in a Washington subway station in 2007. Over 1,000 people walked past but only seven stopped for more than a minute. Young Dylan wants to listen, but his mom rushes on. Later in the day, the same music is heard on the radio and mom finally gives in; the two dance in the kitchen. 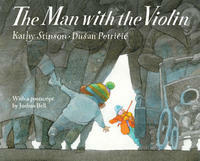 The Dance of the Violin is the story of Joshua Bell’s early musical start. At age seven he fumbles a very difficult piece in a competition then boldly asks to start over. Stinson deftly describes the music as dancers spilling from the violin, with skirts twirling, flinging each other until dizzy. 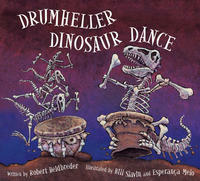 Drumheller Dinosaur Dance, by Robert Heidbreder, illustrated by Esperança Melo & Bill Slavin, is a beat-filled rhyming book to be used with young ones. Set in the badlands of Alberta, this one begs for budding choreographers, with its repeating chorus of "boomity-boom, rattley-clack, thumpity-thump, whickety-whack”—dinosaur bones awakening for a midnight dance. On her first day as teacher-librarian, Julie Booker was asked by a five year old if that was her real name. She's felt at home in libraries since her inaugural job as a page in the Toronto Public Library. She is the author of Up Up Up, a book of short stories published by House of Anansi Press.